Seventy-six million kilometres away on the planet Mars, two robotic rovers have been toiling for years in the name of science. This month has brought success for one them and trouble for the other. For the older rover, Opportunity, it's bad news. Over the past few weeks a huge dust storm has spread to cover a quarter of the entire planet. Opportunity is solar-powered and is no longer receiving enough sunlight to function, so almost all its systems have been shut down to conserve energy. Hopefully this will enable it to ride out the storm but Martian dust clouds can last for months, making survival very difficult. A silver lining is that NASA's other rover, along with several space probes orbiting Mars, are well-placed to study this storm and learn a lot about extreme weather on other planets. If Opportunity does succumb to the storm it will be the end of a spectacularly successful mission. This rover was only designed to last three months on Mars but has been working almost flawlessly for over fiften years. The other rover, Curiosity, is not affected by the storm and is having a much better time. In one of its most significant discoveries since landing there in 2012, Curiosity has found clear evidence of organic molecules on Mars. This doesn't necessarily indicate life but organics are important building blocks of life as we know it. This discovery will keep scientists excited and busy for a long time. Mars is currently in a good position to be seen from New Zealand in the evening. A striking deep red colour, it rises in the east at about 8:30 pm and will rise a little earlier each night in the coming weeks. Also look out for a bright Jupiter higher in the evening sky and orange-tinted Saturn between Mars and Jupiter. Speaking of Jupiter, last month we talked about the possible termination of the Juno mission. NASA has since announced that Juno is safe and the mission has been extended for three years. 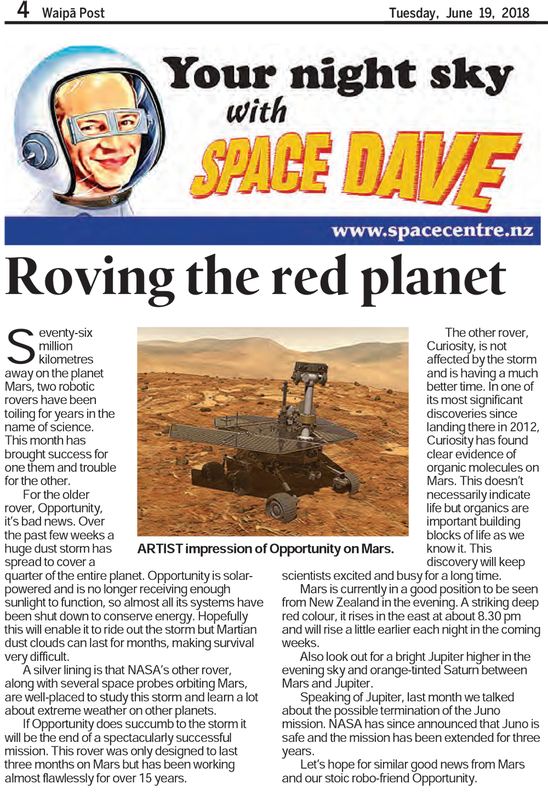 Let's hope for similar good news from Mars and our stoic robo-friend Opportunity.